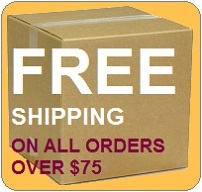 All of these purple martin bird house plans are available here FREE OF CHARGE. Click on an image for more information. YES! FREE purple martin house plans that fulfill ALL the needs of the modern purple martin landlord are available. Houses that offer enlarged deep compartments, easy to open compartments for easy nest checks and easy to follow full color photos with step by step instructions. Check them out below. Not all plans are equal but we pride ourselves in making the plans available to you in one convenient place. It is recommended that compartments be enlarged by closing alternating entrance holes and opening alternating compartment walls. So that martin house compartments are 6" x 12". 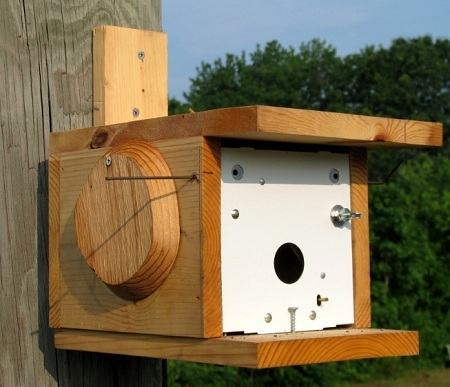 For plans to build this Purple Martin bird house click the button below. 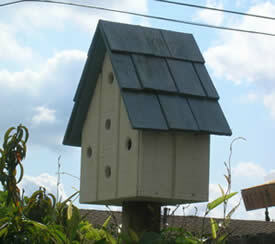 For plans to build this Styrofoam Home for your Purple Martins click the button below. These PDF plans provided graciously by Bob n Jo in Iowa. 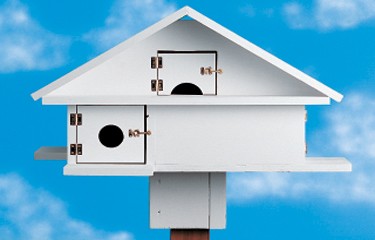 These purple martin house plans are ideal. The martin house features large 6 inch x 12 inch enlarged compartments, easy instructions and templates for Starling Resistant Entrance Holes (SREH) and easy to clean individual compartments. These plans were designed with guidance from the Purple Martin Conservation Association and prove that quality martin housing IS available for FREE. 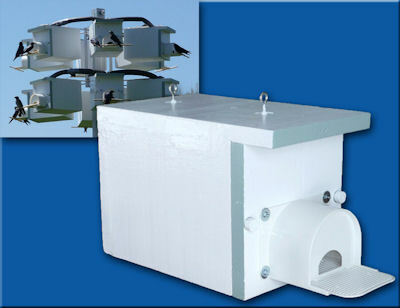 The Taverner purple martin houses feature enlarged compartments as is recommended by the PMCA and are easy to clean and easy access for nest checks. 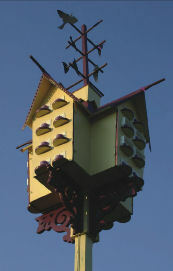 They are very similar to the T-14 purple martin house but are more ornate and have many more rooms. 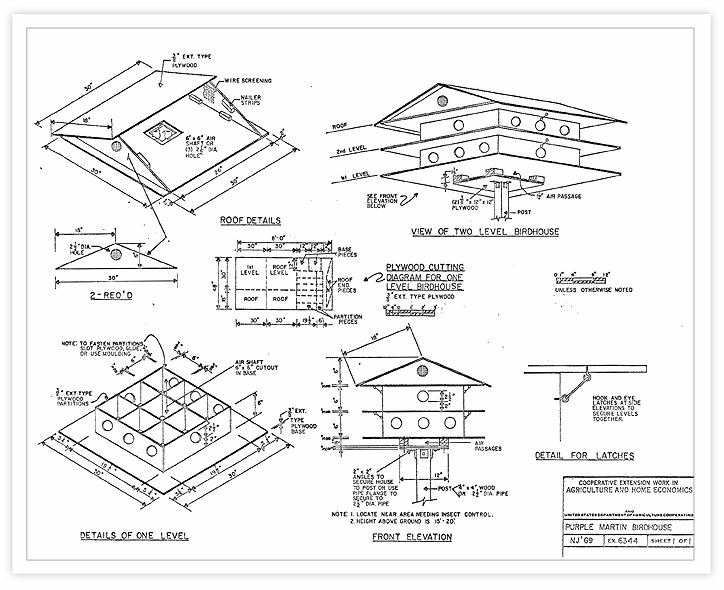 These free purple martin bird house plans provided graciously by Purple Martin Landlord John Balga of Ontario, Canada. This file is a full color, step by step, 39 page pdf file and may take some time to upload. These free sparrow trap plans provided graciously by Purple Martin Landlord Brad Biddle. This file is a full color, step by step, pdf file. 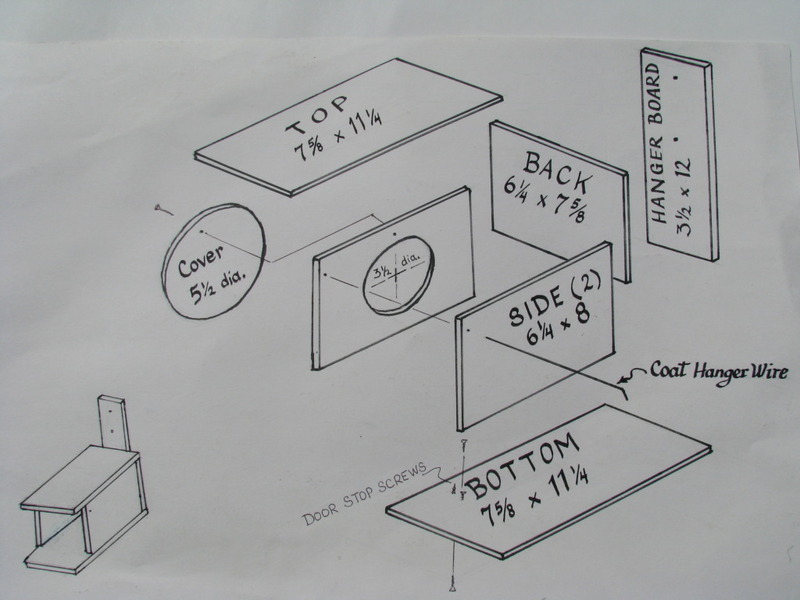 These free purple martin bird house plans provided graciously by Purple Martin Landlord John Balga of Ontario, Canada. 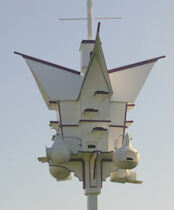 The Taverner purple martin houses feature enlarged compartments as is recommended by the PMCA and are easy to clean and easy access for nest checks. 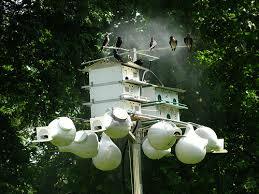 They are very similar to the T-14 purple martin house but are more ornate and have more rooms. This file is a full color with photos, step by step, 37 page pdf file and may take some time to upload. 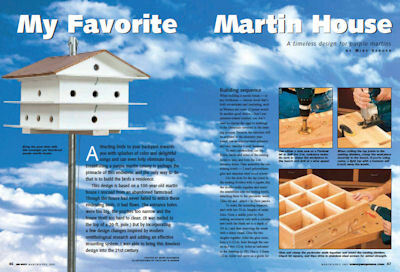 For the 4 page, full color pdf article from Handy Magazine with instructions to build this Purple Martin bird house and a winch pole system to raise and lower, click the button below. 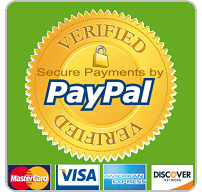 Click on image to go to site. Full instructions and supply list. 3. Stand the 2 sides on end and fasten the back using 1 ½ " deck screws. 5. At the upper front of both sides carefully measure 1 ¼ " down and 3/8" in from the edge,mark the point then indent with a small punch and carefully drill a 1/8" hole as level as possible, drill all the way through. 6. Cut an 11" piece of wire from a stiff clothes hanger, bend one end down then push it all the way through both 1/8" holes in the 2 sides. This is your hanger wire for the spare-o-door. 7. Place box on its back so the bottom is facing you, at the upper left corner measure down 2 ¾ " and 1 1/4" in from the edge.Mark the spot and drive an 1 ¼ deck screw as straight as possible,the point should be pointing up, this is your inside door stop. 8. Hang the spare-o-door then push it against the inside stop, keeping the door tight against the inside door stop drive a screw on the outside of the door to keep it tight against the stop. It should not shake. 10. If using the access port, drill a 3/16" hole in the port cover 1" in from any point on the circle,keeping the 3/16 hole at the top, center the cover over the access hole then slide it up slightly and drive a screw into the side through the 3/16 hole, do not tighten, the cover should pivot on the screw. 12. To capture birds through the access port use 2 hands, one hand covers the opening while you use the other hand to reach inside. I slide the cover over with the same hand I use to reach inside, opening it just enough to get inside. Click on image for full sized jpg picture of plans. Many thanks to Raymond Gingerich for making these plans available. Available as a PDF document or a word document. It is paramount that all points where water can enter nest compartment be completely sealed off to prevent wet nests. We only recommend misting in severe heat situations with certain guidelines. Do not mist at night. Mist for short intervals during hottest portion of day, turning off frequently. Allow martin housing to dry in between misting. Place mister so water is not directly pointing at or going into nest compartments. 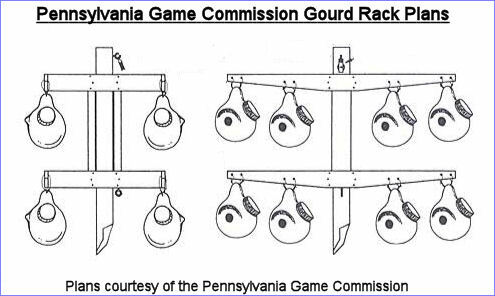 Use caulk or silicone sealant to seal any areas where water can trickle in especially gourd hanging bracket holes. Monitor frequently for any problems especially wet nests. Gracious Thanks to Thomas Bumby for letting us make this information available to you. 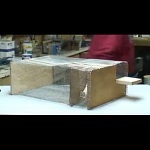 Here are 3 links to a great series of YouTube Videos that show how to make a repeating baited Sparrow Trap. Video links courtesy of "Bruntdog"